S Sahu, S Bhushan, P Sachan. Clinco-Anatomical And Radiological Study Of Varicose Veins Of Lower Limb And Their Management Outcomes. The Internet Journal of Surgery. 2012 Volume 28 Number 2. Twenty percent of varicose vein surgery worldwide including India is done for recurrent disease, which frequently is due to technically inadequate or inappropriate treatment most often based on incomplete knowledge of this fascinating yet troublesome disease. Aim of the study: To study the clinical presentations and venous Doppler findings of varicose veins of legs and study the outcome of conservative and surgical measures. 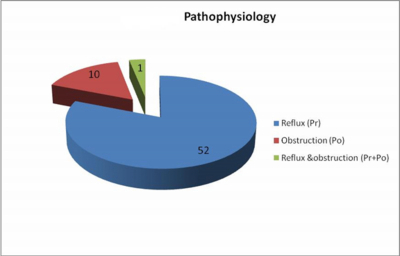 Material and methods: This prospective study was carried out over a period of 12 months in the Department of General Surgery at Himalayan Institute of Medical Sciences, Dehradun, where all patients with varicose veins of the lower limb were included. The clinico-etiological and radiological assessments of the varicose vein were classified under the Clinico-Etiological-Anatomical-Pathological classification (CEAP Classification). Management was done either by conservative or surgical measures depending upon the evaluation of the patient. 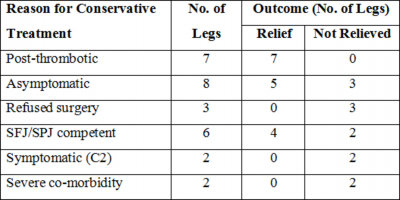 Results: Patients with CEAP Class 4 or more will invariably be symptomatic and even if the saphenofemoral or saphenopopliteal junctions are competent they should undergo surgical treatment specially to avoid any future ulceration. The aim of the study was to study the clinical presentations of varicose veins, correlate the clinical presentation with venous Doppler findings and study the outcome of both conservative and surgical measures. Management was done either by conservative or surgical measures depending upon the evaluation of the patient. Patients were followed up for up to one year. 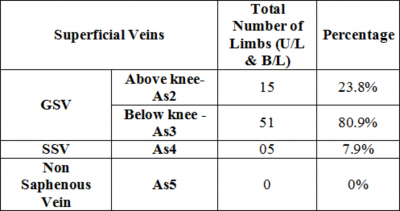 A total of 50 patients of varicose veins of the lower limb were included in the study. In patients who presented with bilateral disease each lower limb was evaluated separately as each limb had its unique presentation. 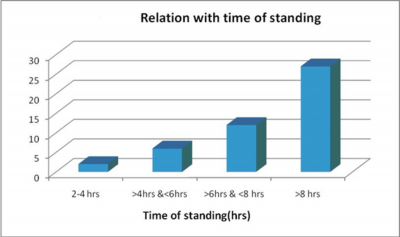 Hence in 50 patients, 63 lower limb presentations were studied. Seventy-eight percent of the patients were male and 22% were female. The commonest age group presenting with varicose veins was 31-40 years (30%) and the least common 71-80 years (2%). It was seen that unilateral presentation (74%) was more common than bilateral presentation (26%). Including both unilateral and bilateral cases, a total of 57% cases had left lower limb involvement and 43% had right lower limb involvement. In the study the commonest clinical presentation was with the complaint of dilated, tortuous swellings/varicose veins in the lower limb which was present in all the cases. (FIG. 1) Including both unilateral and bilateral cases, a total of 57% cases had left lower limb involvement and 43% had right lower limb involvement. 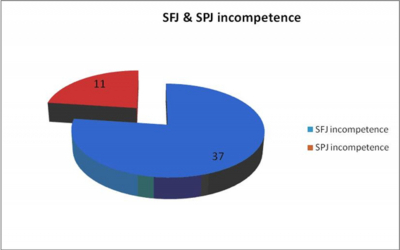 It was observed in the present study that 5 patients with leg ulcers out of 18 had SFJ incompetence and 4 had SPJ incompetence. 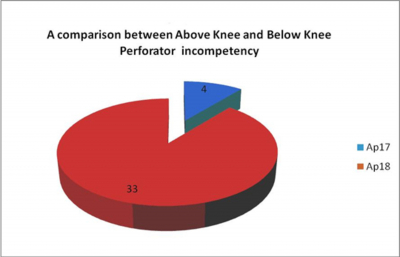 Perforator incompetence was found in the maximum number, 12 out of 18 cases (66%), and deep venous insufficiency in 6 legs (33.3%). Varicose veins (VVs) of the lower limbs are a common complaint that can take many forms, ranging from a non-pathologic condition to an invalidating chronic disorder. In our study, 90% of patients were under primary etiology. 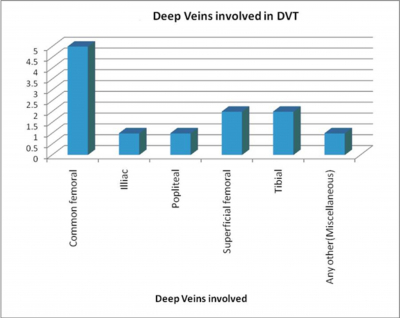 In the superficial veins, 15 lower limbs had above-knee Great Saphenous Vein (GSV) involvement (23.8%) and 52 lower limbs had below-knee GSV presentation (80.9%). 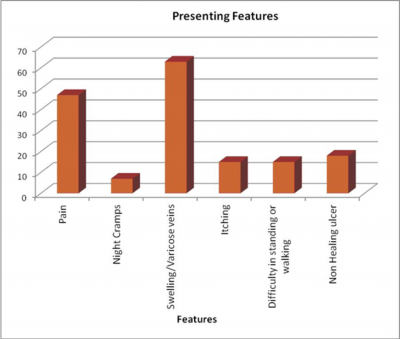 The SSV was involved in 4 cases which comprised 7.9%. 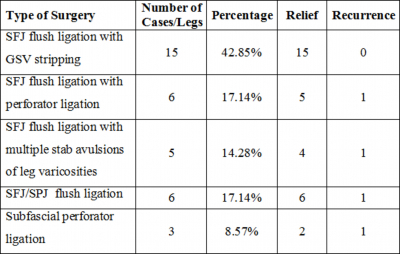 There were 9 cases with both above-knee and below-knee GSV involvement. Varicose veins are a combination of permanently elongated and dilated veins whose path has become tortuous, inducing pathological circulation with a wide spectrum of presentation ranging from telangiectasia to lipodermatosclerosis and active ulceration. 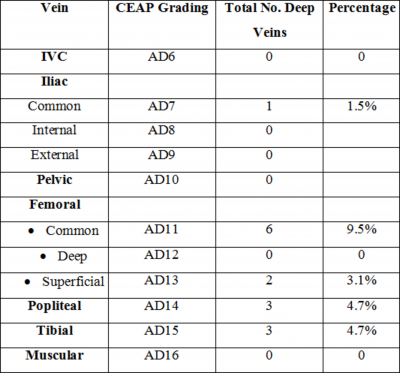 The C-E-A-P classification is a recent scoring system that stratifies venous disease based on clinical presentation, etiology, anatomy, and pathophysiology. This classification scheme is useful in helping to thoughtfully assess a limb afflicted with venous insufficiency and then arrive at an appropriate treatment plan. 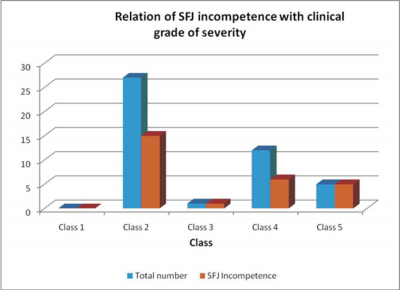 Patients with CEAP Class 4 or more will invariably be symptomatic and even if SFJ/SPJ are competent they should undergo surgical treatment specially to avoid any future ulceration. 1. Pedgaonkar PK, Sekhar R: Current concepts in management of varicose veins. In: Gupta RL (ed. ): Recent Advances in Surgery. 12th ed. New Delhi: Jaypee Brothers Medical Publishers Ltd; 2010: 154-184. 2. Nael R, Rathbun S: Treatment of varicose veins. Current Treatment Options in Cardiovascular Medicine. 2009; 11(2): 91-103. 3. Angle N, Freischlag JA: Venous Disease. In: Townsend, Beauchamp, Evers, Mattox (eds. ): Sabiston Textbook of Surgery. 17th ed. Philadelphia: Elsevier Publishers; 2004; 2053-2070. 4. Lim CS, Davies AH: Pathogenesis of primary varicose veins British Journal of Surgery; 2009; 96: 1231-1242. 5. Evans CJ, Fowkes FG R, Ruckley CV, Lee AJ: Prevalence of varicose veins and chronic venous insufficiency in men and women in the general population: Edinburgh vein study. J Epidemiol Community Health; 1999; 53: 149-53. 6. Carpentier PH, Maricq HR, Biro C, Poncot-Makinen CO, Franco A. Prevalence, risk factors, and clinical patterns of chronic venous disorders of lower limb: a population based study in France. J Vasc Surg 2004; 40:650–9. 7. Engelhorn CA, Cassou MF, Engelhorn AL: Does the number of pregnancies affect patterns of great saphenous vein reflux in women with varicose veins? Phlebology; 2010; 25: 190-195. 8. London NJM, Nash R: ABC of arterial and venous disease. BMJ; 2000; 320: 1391-4. 9. 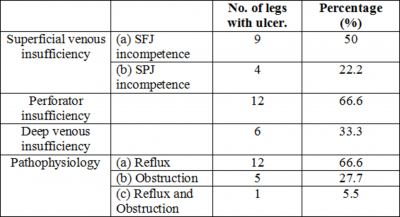 Goutham Reddy Kompally, R. N. Satish Bharadwaj, Gurjit Singh: Varicose veins: clinical presentation and surgical management Indian J Surg; 2009; 71: 117-120. 10. Moore HM, Gohel M, Davies AH: Number and location of venous valves within the popliteal and femoral veins – a review of the literature. Journal of Anatomy; 2011; 219; 439-443. 11. Linton RR: The operative treatment of varicose veins and ulcers, based upon a classification of these lesions. Ann Surg; 1938; 107: 582-93. 12. Mercer MG, Scott DJA, Berridge DC: Preoperative duplex imaging is required before all operations for primary varicose veins. British Journal of Surgery; 1998; 85: 1495-1497. 13. Weiss RA, Weiss MA: Controlled radiofrequency endovenous occlusion using a unique radiofrequency catheter under duplex guidance to eliminate saphenous varicose vein reflux: a 2-year follow-up. Dermatol Surg; 2002; 28: 38-42. 14. Michaels JA, Campbell WB, Brazier JE, Macintyre JB, Palfreyman SJ, Ratcliffe J, Rigby K: Randomised clinical trial, observational study and assessment of cost-effectiveness of the treatment of varicose veins (REACTIV trial). Health Technol Assess; 2006; 10(13): 1-196, iii-iv. 15. Stalder PA, Berridge DC: Surgical treatment of superficial venous incompetence: Surgery of the saphenous veins. In: Negus D, Coleridge Smith PD, Bergan JJ (eds. ): Leg Ulcers. Diagnosis and Management. 3rd ed. UK: Edward Arnold Publishers Ltd; 2005; 131-140. 16. Van den Bremer J, Moll FL: Historical overview of varicose vein surgery. Ann Vasc Surg; 2010; 24(3): 426-32. 17. Bhutia SG, Balakrishnan A, Lees T: Varicose veins. Journal of Perioperative Practice; 2008; 18(8): 346-53.